The vision of the Multilingualism for Equitable Education Policy is that all Hawai‘i State Department of Education (HIDOE) schools embrace, promote, and perpetuate multilingualism and multiculturalism to support and advance learners, families, and communities. All cultures and languages are valuable resources. Multilingualism creates learning environments that draw from the rich linguistic diversity and cultural strengths of Hawai‘i’s students. The Board of Education (BOE) recognizes the important role of multilingualism in providing a meaningful and equitable education for student achievement. The Multilingualism for Equitable Education Policy 105-14 guides the HIDOE and its schools to embrace, promote, and perpetuate multilingualism and multiculturalism to support learners, families, and communities. Hawai‘i is multicultural and multilingual. There are two official state languages (Hawaiian and English). Up to 14 percent of students have been identified as English Learners (ELs) over the past five years; the top five languages spoken at home are Ilokano, Chuukese, Marshallese, Tagalog, and Spanish. Studies consistently show that when students’ identities, histories, cultures, and languages are included in a meaningful and equitable way, they are better able to learn and succeed in school and beyond. provide outreach supports to families to become actively engaged in their children’s education. The goals for this policy were written to be inclusive of all major language groups in Hawai‘i: Hawaiian, English, World/Heritage Languages, and American Sign Language. The most recent report made to the Board of Education is available here. Learn more about how the Multiculturalism Policy aligns with the Strategic Plan and implementation below. Research findings have consistently pointed to the academic, linguistic, and social benefits of allowing students identified as ELs to continue developing their home languages while learning English. Examples of such benefits include: gaining content knowledge in familiar languages, which positively impacts cognitive development; greater proficiency in multiple languages; and affirmation of students’ identities, which positively impacts achievement. Research findings have also pointed to various benefits of bi/multilingualism for young people who are not identified as ELs. These benefits include improved multitasking skills, deeper awareness and appreciation of different cultures, and increased cultural competence. It is because of these benefits that HIDOE has established a biliteracy seal that students may optionally pursue to enhance their diploma. Many Hawai‘i schools are already integrating multilingualism and multiculturalism into their school culture and curriculum in a variety of ways. 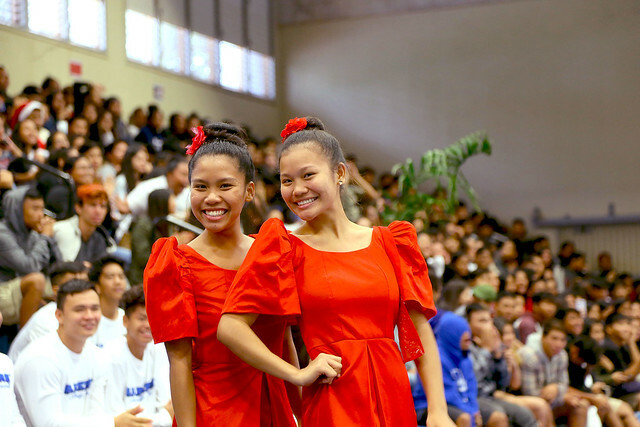 On Dec. 21, 2017, the annual Ho’olaule’a was held at Maui High School, planned and led by high school senior Teisah Kauvaka-Vaaimamao and featuring student performances representing nine cultures including Japan, South Korea, Philippines, Hawai‘i, Tahiti, Tonga, Samoa, Pohnpei, and Marshall Islands. It included 66 student performers, one faculty member and three alumni. Events such as these demonstrate how students excel through Multilingualism and Multiculturalism in our diverse state, and is another example of ways that students can bring community languages and culture into school. For more than 20 years, Queen Ka‘ahumanu Elementary has been inviting students and their families to share their community languages and cultures through the annual Culture Day celebration. What began as an EL classroom project has grown to a two day, school-wide event that students and families look forward to participating in each year. During the 2017-18 school year's event (pictured right), more than 10 cultures were represented in the celebration including Chinese, Thai, Vietnamese, Japanese, Chuukese, Czech, Filipino, Cambodian, Korean, Marshallese, and other Micronesian cultures. School staff work together with parent volunteers and students to plan the sharing of culture-specific food, activities, and displays. Highlights over the years are as varied as the community itself and have included many different kinds of activities such as lion dances, taiko drummers, and Korean dancers. ELs at the school attend one day as a guest and another day as a presenter sharing their languages and cultures with classmates, families, and community members. Following the event, students are encouraged to reflect on the importance of Culture Day through drawings and writings that summarize their thoughts and feelings about what the day means to them and their community. The first goal of the Strategic Plan 2017-2020 is Student Success. Within this goal, it is stated that “Students succeed when their individual needs are met and their innate gifts and abilities are nurtured.” The Multilingualism Policy addresses this objective in that it supports a meaningful and equitable education for student achievement by highlighting each student’s linguistic diversity and cultural strengths. The Multilingualism Policy recognizes and works toward providing effective educators with the appropriate knowledge, skills and materials. This aligns with the second goal of the Strategic Plan, Staff Success. Within the Multilingualism Policy implementation plan are activities that aim to improve professional learning opportunities for teachers, school administrators, and staff to work with multilingual students and to expand licensure by adding options for languages commonly found in Hawai‘i communities. The final goal of the Strategic Plan is Successful Systems of Support, which includes innovation and adequate and expanded resources. The Multilingualism Policy strives to be inclusive of all multilingual communities by seeking input from various community stakeholders throughout implementation. It is also understood that every school has a unique multilingual community requiring innovative and creative plans to draw on the strengths and to address challenges on a case-by-case basis. The Multilingualism Policy seeks to conform to the individuality of each community and to be inclusive of all voices of that community. SD4: Define/expand language acquisition approach: EL, biliteracy, dual language, Hawaiian language. SD6: Evaluate and define special education approach and EL program approach. TC3: Identify best practices for teaching ELs; provide training, set statewide expectations. SV10: Structure opportunities for students to bring their community languages and culture into school.